Roger Miller in Australia with his good friend, John Laws. Glen Campbell, Roger Miller & Roy Clark on "Hee Haw". Roger Miller ca. 1986. Caption on this photo read "It took me seven years to become an overnight sensation." Roger Miller with his dear friend Don Meredith. Roger Miller with one of his heroes, Ray Price. ca. late 80's. (L to R) Rover Sovine, Roger Miller, Garrison Keillor, Chet Atkins. Clint Black, Lisa Hartman, Dolly Parton, Dean Miller. 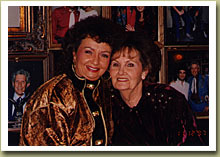 Dedication of the Roger Miller Memorial Rose Garden at "Dollywood"
"The Family Historian" (L to R) Martha Holt Nichols and Roger's mother - Lauden Burdine at the Opry House, 1997.